Plea For Citizens' Charter And Grievance Redressal Commission: SC Asks Petitioner To Approach Govt. The Supreme Court on Monday required NGO Bharatiya Matadata Sangathan to make a representation before the Central government to provide a Citizens’ Charter, notify the Grievance Redress Officer in each government department and to establish a Grievance Redressal Commission. 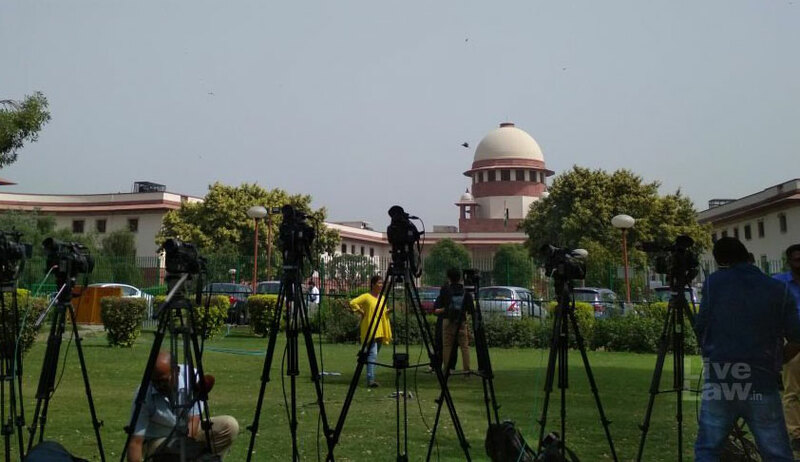 The bench of Chief Justice Dipak Misra, Justice D. Y. Chandrachud and Justice A. M. Khanwilkar noted that the matter involves a policy issue and the court cannot issue a writ to the Parliament to enact a law. The Counsel appearing on behalf of the petitioner organisation had submitted that the Right of Citizens for Time-Bound Delivery of Goods and Services and Redressal of Grievances Bill of 2011, making it mandatory for every authority to publish a Citizens’ Charter to address grievances within 30 days, was adopted in principle by a resolution passed by both the House of the Parliament but the Bill had subsequently lapsed. “Accountability and transparency are a part of Article 21. The only relief we have sought is to cut red tapism in government departments. They only need to tell the citizens what the services being offered are, the timelines, where to get the form and to direct them to the grievance redressal Officer if the timeline is not met”, he had elaborated, adding that the similar recommendations have been advanced by Transparency International. Advancing that Citizens’ Charter is also a prayer in the Lokpal and Lokayukta appointment matter pending before Court 2, he had also suggested that this petition be tagged with it. However, the bench did not concede. The petition avers that Existing Citizen Charters have several shortcomings:​ (i) No funds have been specifically earmarked for sensitising the public about the Citizens’ Charter or for the orientation of the staff on various components of the Charter; (ii) Many ministries have not adopted the Citizens’ Charter on the ground that they are not public organizations like the Ministries of Home Affairs, of Human Resource Development etc. Other Ministries have failed to implement the Charter despite having one, like the Ministries of Rural Development, of Women and Child Development etc. ; (iii) Absence of penal provisions in case of non implementation of the spirit of charter. It throws light on the consequent injury caused to the public on account of the failure of the Government in appointing the Lokpal at the Centre and the Lokayuktas in the States, in pursuance of the Act of 2013, as well in providing a citizens’ charter in every government department. “Hence, the right to time bound service is not recognised in the spirit of the Article 21”, laments the petitioner.